Another thing millions of people have heard about VDS? It’s light. So light it requires only fingertip pressure on the steering wheel. So light, in fact, that a hamster could steer it. And, bizarrely enough, that’s how millions more people got another indirect lesson on VDS – with another YouTube video, The Hamster Stunt….in which Charlie, a 175gm hamster, “steers” a VDS-equipped Volvo FMX along a scary bit of rocky track, up the side of a Spanish quarry. A hamster wheel is fixed to the FMX’s steering wheel – and Charlie’s tempted (with a dangled carrot) to dart back and forth to turn the steering wheel, as required to negotiate the cliffside road’s twists and turns. (See here) Just as Jean-Claude survives the splits, Charlie gets the FMX safely to the top. How does this VDS perform in real life – on real roads, with ordinary, everyday people at the wheel…and not a stuntman in sight? Well I’ve had the chance in the last year or so to drive VDS-equipped Volvos on roads and test tracks in Sweden and Australia – on highways, back-country roads, in a quarry and on purposely-severe test-track washboard corrugations. And I came away hugely impressed – and thinking that this kind of system (Volvo was the first to market, but others are now rushing to follow), which completely takes the steering wheel shock out of potholes and negates the effect of road camber and side winds, will be perfect for New Zealand’s notoriously bumpy, patched-up, off-camber and winding roads. Volvo Trucks NZ GM Clive Jones plans to run the tractor for three or four months – clocking up 5000-kilometres or more, hooked-up to a quad-axle semi toting a container and concrete ballast to bring its all-up weight to 43-tonnes. He’ll gather feedback from truck drivers and transport operators to add to his own driving experience before deciding (probably in January) whether or not it’s right for release in NZ. It is, he says, a matter of “actually taking it out on NZ roads and making sure.” So far he’s driven most of the Heading for the series of tight turns through the Manawatu Gorge, where VDS displays nice, positive feedback through the steering wheel 2500kms it’s done here. Our first impressions are that this VDS is nothing spectacular – to look at, that is! Before we leave importer Motor Truck Distributors’ Palmerston North HQ, we tilt the FM’s cab…and find a relatively insignificant-looking unit, comprising an electrical motor attached to the steering shaft. For the sake of some winding, second-grade road, we head for Hawke’s Bay via the Saddle Road – across the southern end of the Ruahine Ranges, from Ashhurst to Woodville. It’s perfect for our purposes – even more so than usual…It’s perfect for our purposes – even more so than usual…since it has roadworks on its upper stretches. For once, we’re happy to see the roadworks signs. Everything about this truck is easygoing, encouraging a calm, relaxed driver: It is a helluva package – a 500-horsepower/368kW Euro 5 SCR engine that produces its 1844 lb ft/2500Nm of peak torque anywhere from 1050 to 1400rpm…Plus an I-Shift transmission that, left to its own devices in automated mode, never seems to falter. It happily lets the D13C 13-litre lug down to exactly 1050 as we near the summit. We go up the hill in 7 never once having his right foot down hard on the throttle. Then there’s the VEB+ engine brake, with its three stages of retardation, as well as an Automatic mode. On the way down the hill, everything’s easily controlled in 7 even with modest revs, never topping 1800. And once we get off the hills – heading north on SH2, then on “the back road” to Napier, SH50 – there’s time to explore the other driver-assistance technology on board the FM. That includes lane-change support – essentially a blind-spot alert system. At speeds above 35km/h it triggers a red warning light on the passenger-side A-pillar and sounds a loud alarm if the driver indicates a left-turn and there’s a vehicle alongside. Volvo says it’ll pick up a motorcycle or anything bigger, but Clive Jones says it even detected a cyclist the other day. The truck has adaptive cruise control, which (at anything over 30k) uses radar to maintain a minimum gap to the vehicle ahead. It includes a collision warning system, which throws up a red light onto the windscreen in front of the driver and sounds an alarm if the vehicle ahead brakes or slows suddenly. He can’t bring to mind a specific example, but says there have been new technologies offered by Volvo “that we didn’t deem as suitable for NZ.” And he adds: “We certainly don’t want to deliver products that don’t work for our customers – and we certainly don’t want to deliver products that our workshops can’t maintain either. On a rough section of road near Norsewood, there’s no other traffic around and Woolston eases off his light grip of the steering wheel – ending up with a mere thumb or palm pressure only. The truck jiggles and bangs….the steering wheel stays steady. The radar in the FM’s collision avoidance system instantly detects that the vehicle ahead is slowing and alerts the driver with a loud audio alarm and a red light reflected up onto the windscreen in front of the driveris perfect for NZ roads. By the time we reach our turnaround point, at Tikokino, Woolston’s sold: “I expected it to have an airy feel to it, but it doesn’t at all. You can still feel the road. It just doesn’t tug at the wheel. He particularly likes it that VDS is all about preventing the kind of back problems that now dog him – caused, he’s sure, by his 15 years of long hours behind the wheel when he was a young bloke. Volvo Trucks reckons that a study of 160 European truck drivers it did in 2011 and 2012 showed that more than half of them suffered back, neck and shoulder pain. Similarly, an independent European study found that 54% of the women and 37% of the men drivers surveyed had muscular and skeletal problems – mostly in the back, neck and shoulders. On “normal” roads, it reckons that VDS reduces the effort necessary to steer a truck by around 75%. Get onto rough roads and “it almost entirely reduces tremors – by 95-100%. says Volvo Trucks’ Jonas Nordquist. “If you take everything that can happen to the driver outside the truck, then repetitive motion from road unevenness and from steering and shifting – so-called whole-body vibration – is the biggest cause of occupational injuries. “A road is never completely smooth. The body will shake with the motion. This creates what in ergonomics is called RSI – repetitive strain injury. It’s a wearing of the muscle – just like tennis elbow, for example. On our return run to Palmy, Clive Jones and I share the driving – Jones revealing one more take-it-easy tool in the FM’s high-tech armoury – the I-Roll function that, when the cruise control speed is set at 90k, takes every opportunity it can to put the I-Shift into neutral. I-Roll is standard for all I-Shift Volvos sold here – and yes, that means virtually every Volvo sold here. There is another piece of smart technology lurking onboard – lurking because it largely stays hidden from view…unless the driver calls it up on the dash. 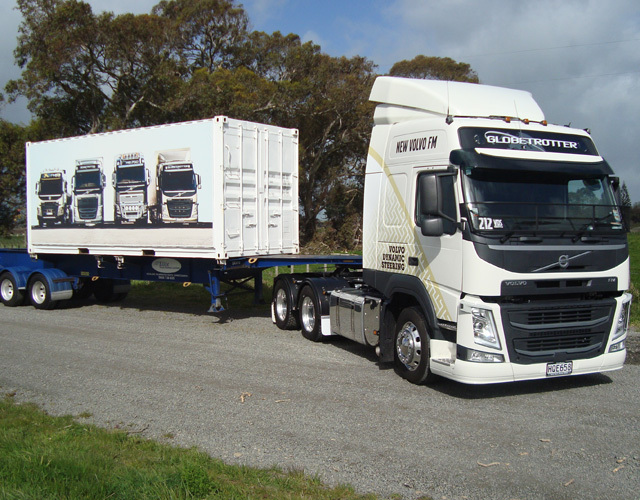 Volvo’s Dynafleet telematics system, now fitted to 55 customer trucks in NZ, is a powerful tool in improving fuel efficiency and profitability. It allows a fleet, a driver and, in this case, Volvo, to see in realtime “everything” about the truck and how it’s being driven: “How drivers use the auto versus the manual, the performance mode, it shows their rev management, idle time, it shows their brake anticipation, it shows how much they’re coasting in terms of on and off boost. So it shows the leadfoot people. He reckons that the results from customers adopting Dynafleet “range from three or four percent fuel saving, to a massive 19%.” The biggest improvement came from an older driver who got behind the wheel of a new Volvo for three weeks, unaware that Dynafleet had been installed. “It was a train-wreck!” says Jones. Volvo showed the owner the data, asked if he wanted to fix it – and, given a “hellyeah!” – went ahead and trained the driver, explaining what he needed to do to achieve a good score. My turn behind the wheel leaves me just as impressed by VDS as I was in my overseas test-drives. And, again, I don’t feel that the system isolates you from the road. Far from it, in fact: On the run through the Manawatu Gorge, for instance, it returns a reassuringly positive feel through the tight corners….even with the light input required and the quad semi’s tendency to cut in. I say so to Clive Jones and he concedes that he had been concerned, before this truck arrived, “that, as much as VDS would take away those bumps and offset cambers and windeffect and so on, we wouldn’t get good road-feel out of it. “And what this validation process has proved is that we do get fantastic road feel. As you increase speed you get more feeling through the steering wheel – but still get the benefit of not having the steering drag and camber and not feeling bumps. It seems that his mind is made up then? “It’s great….delivering better than we thought.” Providing it continues to perform like this, it’s clearly going to be added to the NZ spec sheets for FM, FH and FMX. To the “doomsayers who say ‘oh well, it’s another European truck with another piece of stuff to go wrong,’ he concedes that only time – longevity and operational reliability – will tell. And if the electronics fail? “That’s been part of the validation as well. We switched it off – and drove it. No problem.” It simply reverts to functioning like conventional, non-VDS steering. VDS is so good – “I’ve made a judgment that this product is sensational” – he’d love to be able to offer it as standard on 6x4s, “because I can’t see any downside. So, on balance, VDS will likely end up an option, at “about $7000” on 6x4s (but won’t initially be available on 8x4s). It may be a little cheaper if it ends up packaged-up with other features, like the collision avoidance, adaptive cruise control and lane-change warning systems on this FM, for instance. “It’s not a lot, when you see what it’ll do for you,” says Jones. We get a feel for the benefits of Dynafleet in particular, back in Palmerston North, when Clive Jones calls up its data for the day – giving us an overall score of 86 out of 100 and average fuel use at 1.93kms per litre, “which is pretty good, considering we went over the Hillbilly Highway. “It’s a good result…..I’m actually very surprised, given our start/stop driving.” We lose marks for too much idle time (partly because of our frequent stops to allow our photographer to get ahead and so on), get a slightly low score on coasting and a high score (63) on braking – some of that down to trying out the collision avoidance warning system on an empty road. Funnily enough, after a couple of hundred kilometres spent getting to know VDS, it’s back in Motor Truck’s yard that we get one final eye-opening demo of its capabilities – that’s as dramatic as anything we’ve seen all day. It’s a tight space and the quad-axle semi isn’t the easiest to reverse, but fingertip pressure is all that’s required as Jones backs the rig in: It’s one of the situations VDS was designed for – and it’s so light (“lighter than a car,” he reckons), it’s easy to over-steer it. But it’s the kerb that provides THE best demonstration: “Watch this,” says Jones, as he pulls forward – bouncing a steerer up onto a kerb at an angle. The steering wheel doesn’t move. At all.